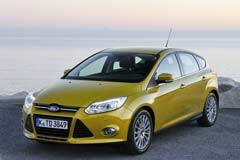 The Ford Focus series is a car that has been produced by Ford Motor Company since 1998. Ford began sale of these models in Europe in 1998 and North-America for the 2000 model year. The car was competitive and was one of the first small cars from a domestic automaker that proved successful against the dominant models from Japan. Buyers looking to buy a used Ford Focus should be happy to know that this car has been named one of Ford's most popular cars worldwide. The car is available at an affordable price, has excellent steering, sharp handling, a good looking interior and impressive styling. It also has strong yet economical engine and it is available in multiple body styles. Ford has gone on to introduce the second and third generations of the Focus. The second generation Focus, however, was not as popular as that of the original car. In the third generation Ford has shown a lot of effort in their work. The new Ford has been rated highly in many reviews and is one of the top picks for a sedan or small hatchback. 2015 Focus SE 2015 Ford Focus, Race Red with 60198 Miles available now!